CONCORD, N.C. - It was fitting that Kyle Busch pulled off the career sweep in dominating fashion. With his show-no-mercy dismantling of the field in Sunday's Coca-Cola 600, Kyle Busch became the only active driver to win a Monster Energy NASCAR Cup Series race at every track on the circuit, finally capturing the checkered flag at Charlotte in his 29th start at CMS. "Just being able to check the box of being able to win at all the race tracks I've raced at in the Cup Series is the dream of a seven, eight-year-old boy," Busch told PRN after the race. "I mean, I absolutely remember watching this race when Jeff Gordon won it for the first time back in 1994 and seeing his tears of joy in victory lane. I would've been nine years old and remember thinking, 'man that is so cool. I want to win that race one day.'" Busch led a whopping 377 of 400 laps and won all three stages en route to the historic win. However, despite the dominance, Busch still came 15 laps short of the all-time mark set by Martin Truex Jr. in the 2016 Coca-Cola 600. How Busch won the race: By showing up to the track. No, but seriously, the No. 18 team was on the mark from the time they unloaded Thursday. Kyle won the pole, had the speed he needed in practice and settled in knowing he was in good shape. Outside pole-sitter Joey Logano grabbed the lead on the opening lap, but Busch passed him after four circuits and never looked back. He was never really challenged over the final 396 laps, easily pulling away on restarts and his pit crew took care of business on pit road at every opportunity. "Just a phenomenal night," Busch said. "Adam Stevens and everybody at Joe Gibbs Racing was just on it, and the M&M's Camry was fast and wanted to stay up front, and it was pretty easy to do that with something driving so good." (Un)Happy Harvick: After starting 39th due to inspection troubles before qualifying, Kevin Harvick started Sunday evening race on a mission. By lap 67, Harvick found his way into the top five and looked to be the only driver in the field with anything for Busch. But it all went south for the 2014 Cup champion on Lap 85, when he cut a left front tire and slammed the wall in Turns 3 & 4, ending his bid for a third Coca-Cola 600 victory. "Sometimes those things happen, I can't complain about anything that's happened this year," said Harvick, who remains third in the overall series standings following his first-ever last-place finish of his 18-year Cup Series career. Welcome back, Chevrolet: Anyone who's followed the 2018 season knows it's been a struggle for the bowtie brigade. 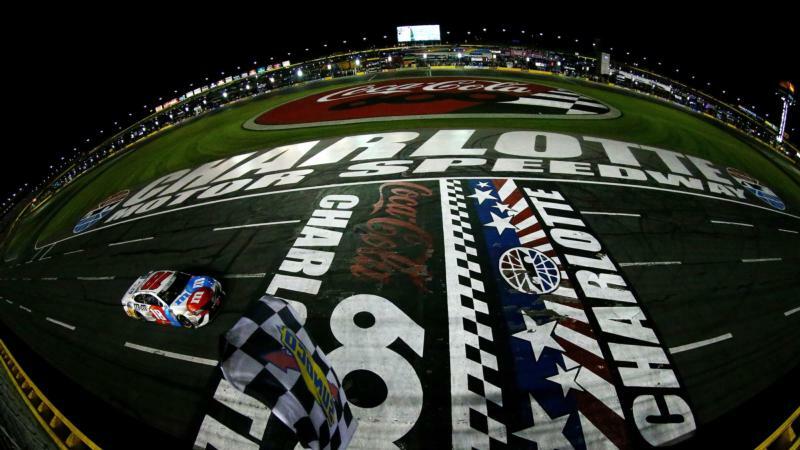 Since Austin Dillon's dramatic victory at Daytona, the Chevrolet camp has been shut out of victory lane, but the Coca-Cola 600 offered some hope for General Motors fans, as five Chevys finished in the top 11, led by Jimmie Johnson's in fifth. Johnson's Hendrick motorsports teammate Alex Bowman also finished in the top 10, as did the Chip Ganassi Racing stablemates Kyle Larson and Jamie McMurray. While the expectations for a seven-time champion and a budding superstar such as Larson aren't simply being near the front, it was a step in the right direction for the manufacturer as they continue to figure out the new Camaro. Blaney's bad luck: If there's one driver who's shown he might be able to challenge Kyle Busch and Kevin Harvick for the 2018 championship, it's Ryan Blaney. But as the old saying goes, if it wasn't for bad luck, he'd have none at all. After dominated the Daytona 500, Blaney was swept up in a late-race wreck. A few weeks later at Bristol, Blaney was crashed out of the lead by lapped traffic. On Sunday night, a fiery explosion ended his night just short of the 450-mile mark. Entering Turn 1, Blaney's No. 12 erupted into flames several laps after the team diagnosed a dropped cylinder in the second stage. Thankfully, Blaney was able to escape the explosion, but his car wasn't so lucky. RCR's rough night: Austin Dillon entered Sunday's race as the defending winner of the Coca-Cola 600. He left this year's race over 50 laps down. Dillon's night turned sour early, as he cut a right rear tire just 38 laps in, which all but ended his hopes for a win. After making another pit stop that led to a trip to the garage for repairs, Dillon finished way back in 34th. Fortunately for Austin, his Daytona 500 victory will likely send him to the playoffs despite being out of the top 16 in points. Ryan Newman kept his No. 31 Caterpillar Chevy in the top 10 for most of the Coca-Cola 600, but things went downhill when a burned up wheel bearing sent Newman to the garage in the final stage. Newman wound up coming home in 35th and sits outside the playoff cut line in the standings. 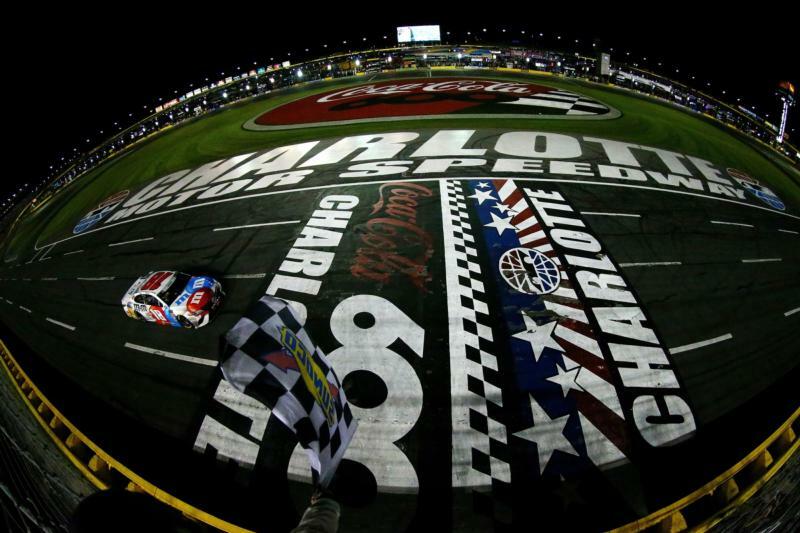 Social media spotlight: It's not easy racing 600 miles on a muggy night in Charlotte. Especially if it's your first time. Isn't that right, Bubba Wallace? The driver of the No. 43 for Richard Petty Motorsports offered fans a glimpse into his struggles Monday after the race. After running as high as 10th, Wallace ended the night in 16th. He currently sits 23rd in the standings in his rookie campaign. NASCAR Salutes: It's a Memorial Day weekend tradition: NASCAR paying tribute to those who made the ultimate sacrifice for our freedoms during the Coca-Cola 600. From the solemn pre-race show featuring hundreds of active-duty military to every car carrying the name of a fallen service man or woman, there aren't many organizations that do it as well as NASCAR when it comes to showing their gratitude to our nation's heroes. Next week: NASCAR makes its first trip to the Tricky Triangle of Pocono Raceway for the Pocono 400! Last year, Ryan Blaney captured his first career win by holding off Kevin Harvick in the closing laps. Can he repeat, or will we see another Kyle Busch romp? Catch all of the action from Pocono at 2 p.m. Sunday on the Motor Racing Network and Fox Sports 1.